Chinese Orange Chicken Recipe combines chicken fragrance and orange juice fresh flavor, with tender meat makes most people fall in love with it. You don't need to be restricted with deep frying when cooking at home. Steam and stir fry are both simple, easy, quick and healthy way. You even don't need cooking oil if don't want to. See how we can make it into low fat cooking. a. 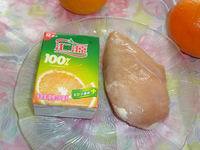 Clean chicken breast, cut into small square flakes. Mix with Sauce A, Marinate for 15mins. b. Now from here, we use 2 methods, with or without cooking oil. 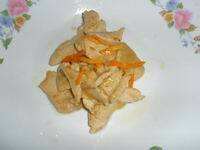 Chinese Orange Chicken Recipe (Stir Fry) without cooking oil. Turn on heat, add 2 tablespoon orange juice and chicken breast in a wok. Stir fry till meat cooked(chicken turns into white color). Turn off heat. Arrange on a plate. Add oil in a wok, add sauce B. Stir fry. Add chicken breast. Stir fry till meat turned white. Mix 2 tablespoon orange juice with 1 teaspoon cornstarch and 1 teaspoon sugar, pour in the wok. Stir fry till well coated. Turn off heat, arrange on a plate. 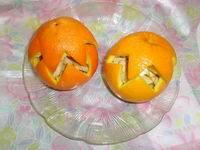 You can arrange cooked dish in an emptied orange. 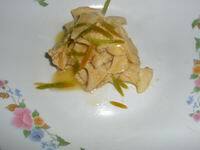 Benefit of these home made Chinese Chicken breast recipe: As it's low fat healthy cooking, it's suitable for those who are obese, or with heart disease. 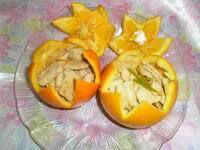 It tastes smooth tender,easy to be digested,so fit to kids or seniors.